On Monday 25th May, as part of Cunard's 175th Anniversary Celebrations, the Three Queens - Mary 2, Victoria and Elizabeth, were on The Mersey at Liverpool together for a short period. Queen Mary 2 arrived the previous day Sunday 24th May, berthing at the Liverpool Cruise Liner Terminal. Queen Mary 2, Cunard's flagship, the biggest passenger ship ever to sail up The Mersey, slipped away from the Cruise Liner Terminal at 1045 hours on 25th May, majestically making her way to greet her two sisters at Brazil Buoy, between Crosby Beach and New Brighton. 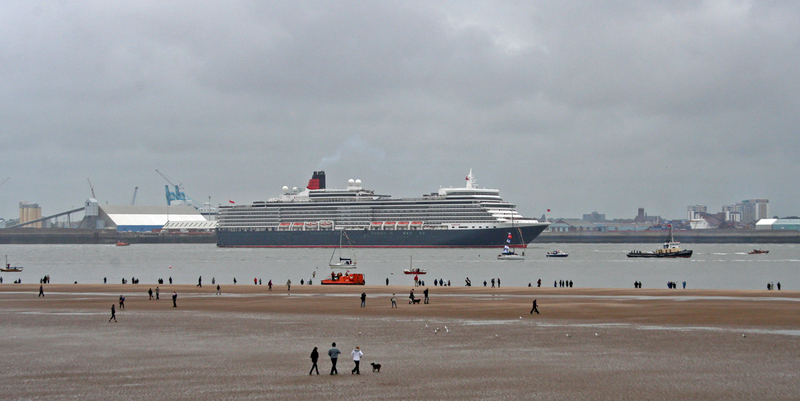 The Three Queens having met up cruised up the River Mersey in convoy, led by the newest of the three, Queen Elizabeth. Essentially, Queen Elizabeth, like Queen Victoria, is a cruise ship in design, rather than an ocean liner, only Queen Mary 2 of the three ships being a true ocean liner. Queen Elizabeth was constructed in Italy between 2007 and 2010, being launched on 5th January 2010. She is the second largest of the Three Queens being slightly larger than Queen Victoria.The ship was formally handed over to Cunard on 4th October 2010, christened at Southampton by H.M. Queen Elizabeth II on 11th October before setting sail on her Maiden Voyage to the Canary Islands the following day. 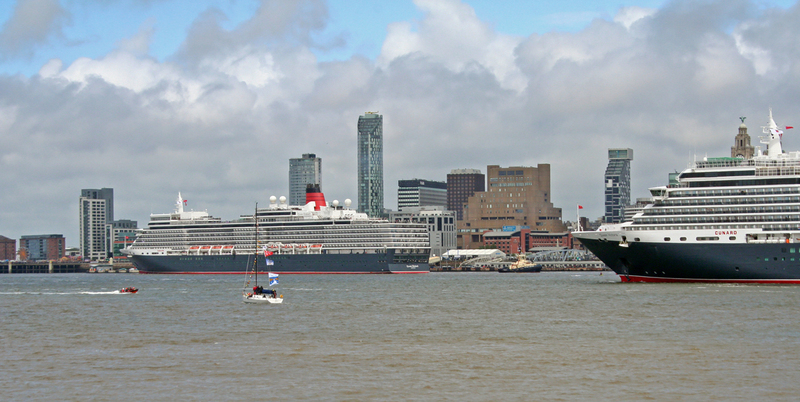 Queen Elizabeth is followed up the River Mersey by Queen Victoria, and another view of Elizabeth. The spectacle was viewed by an estimated 1.3 million people! Queen Victoria, the smallest of the Three Queens, was in the middle of the convoy. Like Queen Elizabeth she was built in Italy and launched on 15th January 2007. She left the Port of Venice on 24th August 2007, to commence sea trials, arriving at Southampton on 7th December. On 10th December she was named by Camilla, Duchess of Cornwal, before embarking on maiden voyage the following day, a 10 days cruise to Northern Europe. A cruise to the Canary Islands followed before Queen Victoria embarked on her first World Cruise, circumnavigating the glob in 107 days. The first leg of this cruise was a tandem crossing of the Atlantic with QE2 to New York City where the two ships met with Queen Mary 2 near the Statue of Liberty on 13th January 2008. 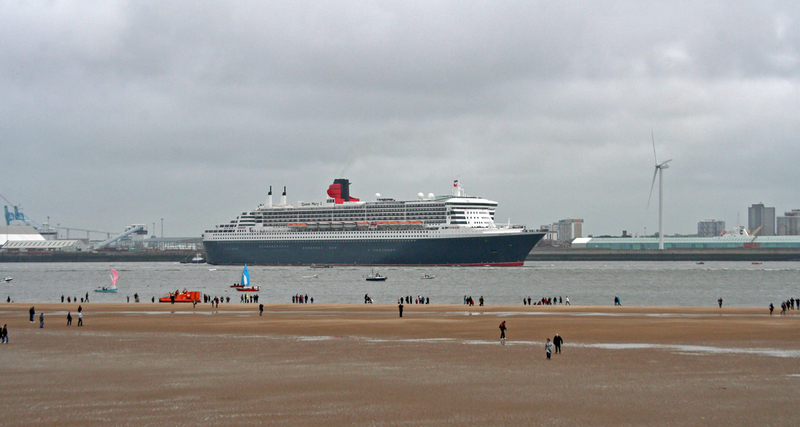 This was the first time that three Cunard Queens had been present at the same location. 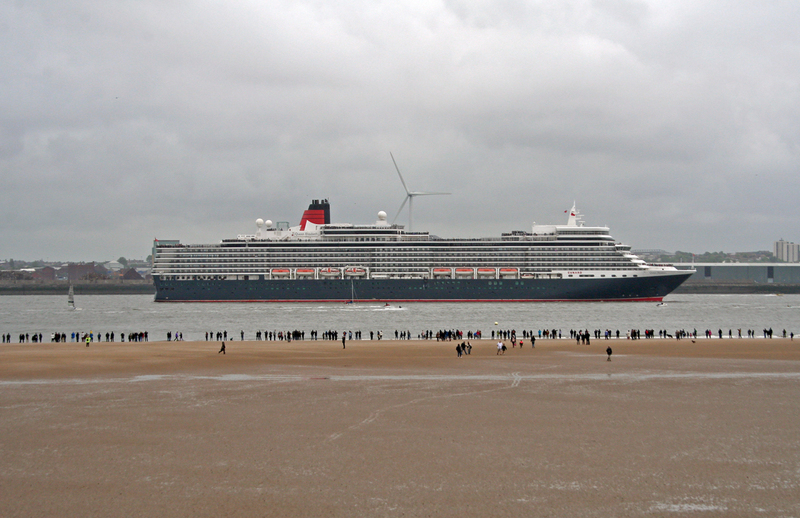 Queen Mary 2, Cunard's flagship, brings up the rear of the convoy. Queen Mary 2, or QM2 as she is often known, was the first ocean liner to be built since QE2. She was constructed in France and launched on 21st March 2003. Her first sea trials took place between 25th. and 29th September 2003, with further trials between 7th and 11th November. Formally handed over to Cunard on 22nd December and arrived in her home port of Southampton on 26th December 2003. Naming by H.M. Queen Elizabeth II took place on 8th January 2004, with the Maiden Voyage to Fort Lauderdale sailing on 12th January. Another view of Queen Mary 2. This won't be her only visit to Liverpool this year as she is due to return for a special sailing on 4th July to re enact the first transatlantic crossing from Liverpool to the New World in 1840. 400 passengers will embark at Liverpool, sailing to Halifax, Boston and New York, the first time in almost 50 years that people have been able to embark at Liverpool to cross the Atlantic. 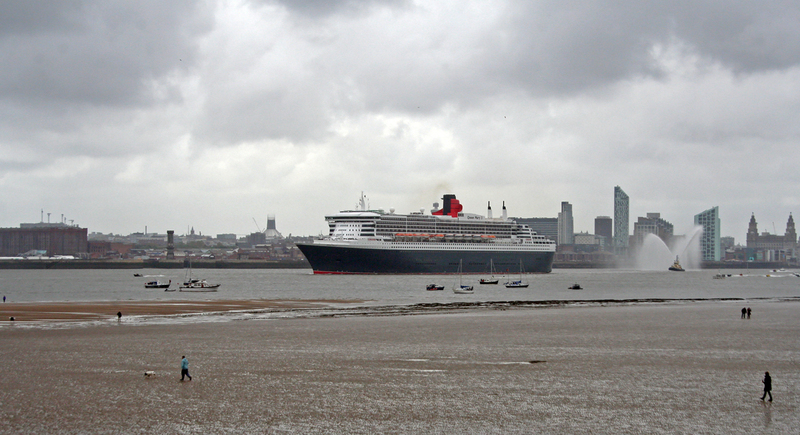 The Three Queens make their way up The Mersey on this historic occasion. 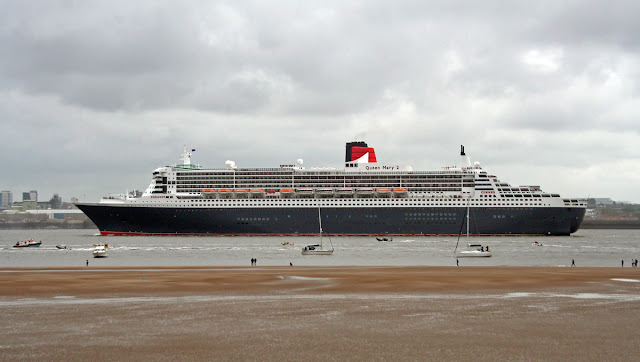 The first time these three ships had been together was on 13th January 2011, when Queen Victoria and Queen Elizabeth had made a tandem Atlantic crossing to join big sister Queen Mary 2 at New York City. Twelve months later all three were in Southampton to celebrate the Diamond Jubilee of H.M. Queen Elizabeth II. On 6th May 2014, all three were together at Lisbon and on departure sailed in a line to Southampton, arriving on 9th May 2014. Prior to the 25th May gathering all three were together in Southampton as they returned from cruises. Now facing down The Mersey the Three Queens pose for the cameras. Queen Elizabeth is out of view, hiding behind Queen Mary 2 in this picture. Queen Victoria is on the Wirrall side of Queen Mary. Queen Victoria was clearly visible from the Wirral side of the river. After a fly past by the Red Arrows Queen Mary 2 left the party just after 1400 hours sailing for St. Peter Port. Queen Elizabeth moved to the Cruise Liner Terminal, leaving Queen Victoria in the river. A fireworks display was scheduled for 2230 hours, prior to the departure of Queen Elizabeth, at which point Queen Victoria was due to take her place at the Terminal for an overnight stay.